SpaceX-3 carries four HD cameras that will be mounted on the outside of the station and beam back to Earth live video of the planet from the International Space Station. The video will be available online and high school student teams will operate the experiment which will analyze the effect of space on video quality. The ultimate goal is to help show what commercially available cameras should make future space trips. Find out more details about the experiment here. The second stage of the Falcon 9 rocket will work a bit of double duty today by carrying five nanosatellites into orbit. Secured inside four specially designed carriers, the five tiny spacecraft will spring free into space soon after Dragon separates from the second stage on its mission to the International Space Station. 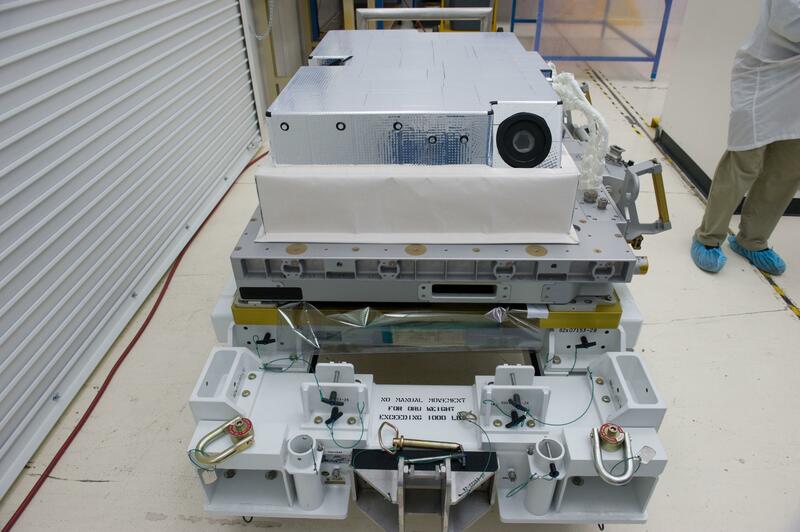 You can read the details of each of the five CubeSats here. 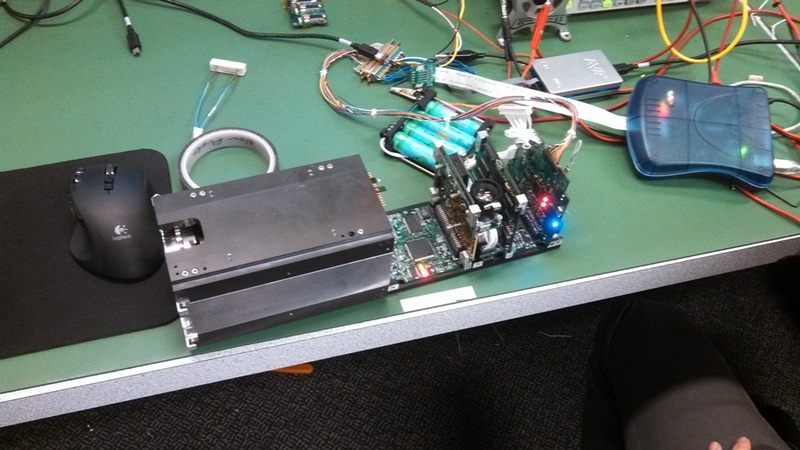 A video of one of the CubeSat missions is below. 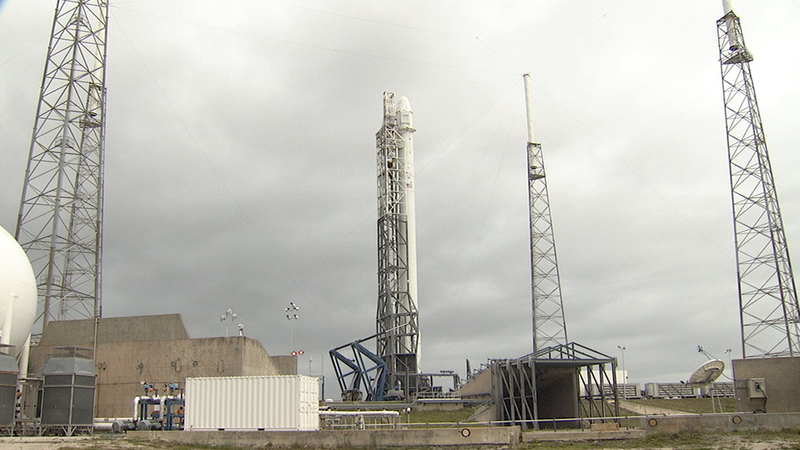 At T-30 minutes, we remain on pace for liftoff on-time at 3:25 p.m. EDT. One of the experiments Dragon is carrying is called OPALS. It will demonstrate a data transmission using lasers which can carry far more data than radio frequencies. The increase is important because the research projects on the station produce a wide range of useful data for analysis. Find out more about OPALS here. The Dragon spacecraft that is being launched into orbit today carries about 5,000 pounds of equipment including science experiments, a spacewalking suit, called an EMU for extravehicular maneuvering unit, plus other spacesuit hardware. There is also a set of robotic legs that will be connected to Robonaut2. The R2 torso is already on the International Space Station where it has been performing numerous tests and simple tasks. You can read more about Robonaut2 and its legs here and here. 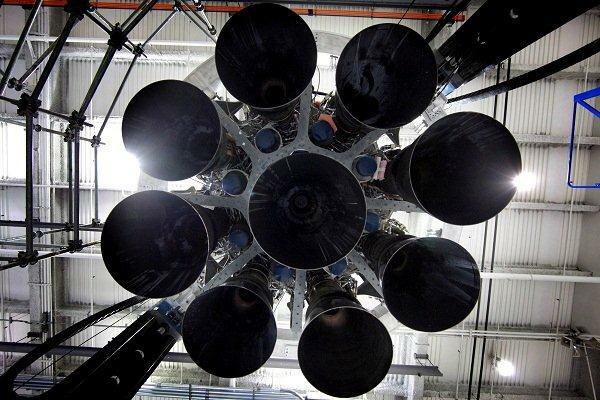 This is the first NASA mission by SpaceX that includes an upgraded version of the Falcon 9. Outwardly, the biggest change is an arrangement of eight engines in a circle around the center engine. Previously, the nine engines were built in three rows of three. SpaceX says the octaweb reduces the length and weight of the Falcon 9 thrust structure and streamlines manufacturing of the first stage. While this is the first NASA mission with an octaweb first stage, the engine pattern flew successfully during several previous SpaceX missions launching commercial payloads. 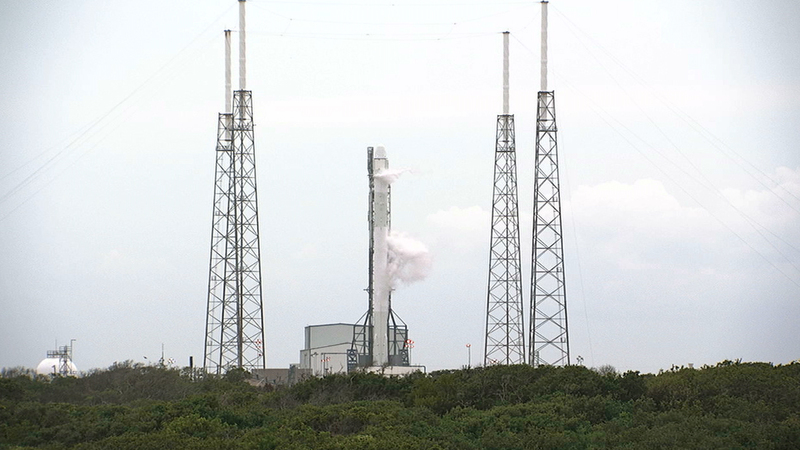 At T-60 minutes, all remains on track for the SpaceX-3 mission to lift off on time at 3:25 p.m. EDT. The spacecraft carries no people, but is loaded with about 5,000 pounds of supplies, experiments and equipment for the International Space Station and its crew of astronauts. Six people live on the space station now conducting research and learning about long-duration spaceflight. Launch Weather Officer Mike McAleenan just improved the forecast to a 60 percent chance of acceptable conditions at launch time. Again, all conditions are “go” now and there are no technical concerns. The Falcon 9 rocket has been loaded with the kerosene fuel and liquid oxygen that will power the nine first stage engines and one second stage engine during launch and the flight into orbit. The first stage engines will generate about 900,000 pounds of thrust at liftoff. The launch window is instantaneous, meaning the liftoff has to occur at precisely 3:25:22 to reach the International Space Station. Good Afternoon and Welcome to the NASA Launch Blog! NASA astronaut Steve Swanson took this photo April 16 from aboard the International Space Station. 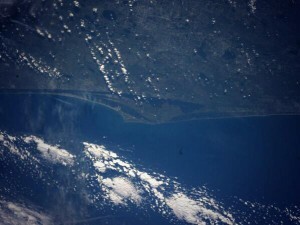 It shows Kennedy Space Center and Merritt Island, plus Cape Canaveral Air Force Station, the launch site for today’s liftoff. 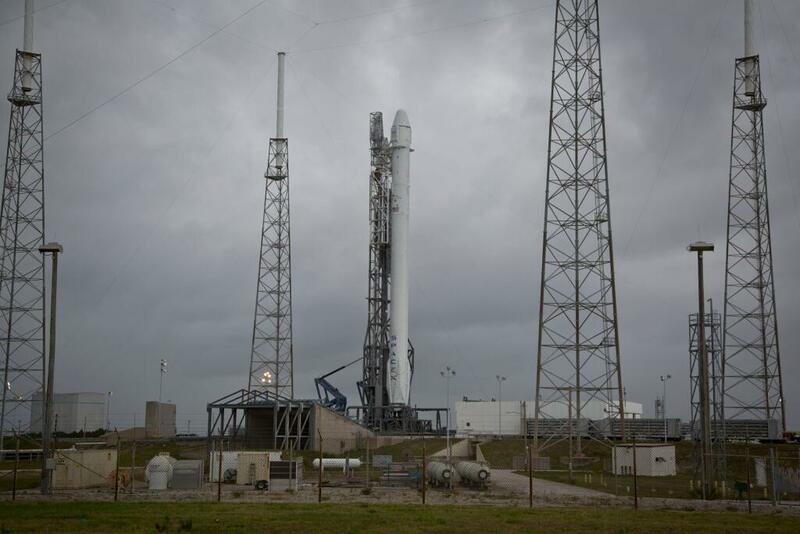 We’re an hour and 10 minutes from the scheduled launch of the third operational SpaceX cargo resupply mission to the International Space Station. The skies over our Florida launch site have been clearing in the last hour or so and the weather is not violating any of the launch criteria right now. 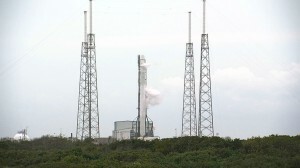 Liftoff remains on target for 3:25 p.m. EDT from Launch Complex 40 at Cape Canaveral Air Force Station. The weather forecast continues to call for a 40 percent chance of acceptable conditions at launch time. You can also watch NASA TV’s streaming launch coverage here. Author Steven SiceloffPosted on April 18, 2014 Categories UncategorizedLeave a comment on Good Afternoon and Welcome to the NASA Launch Blog! Good morning from a cloudy Florida where SpaceX is preparing to launch its third operational mission to the International Space Station. 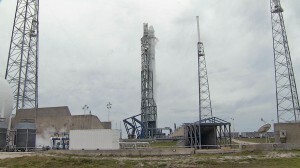 The Falcon 9 rocket and Dragon spacecraft loaded with cargo have been rolled to the launch pad at Launch Complex 40 at Cape Canaveral Air Force Station and raised to its vertical launch position. Today’s launch time is 3:25 p.m. EDT with an instantaneous launch window to allow a link up with the International Space Station. 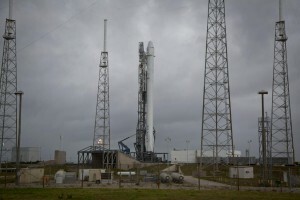 The weather forecast still offers a 40 percent chance of acceptable conditions at launch time and meteorologists will spend the day surveying the skies for signs of thick clouds or other launch rule violations. 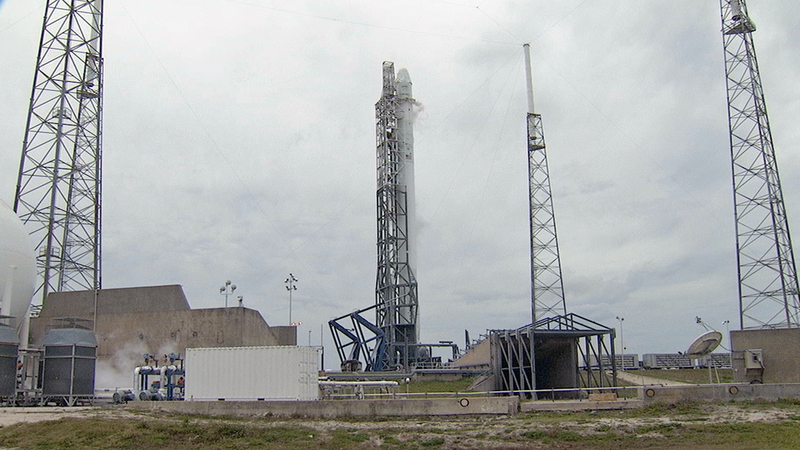 NASA’s continuous coverage will begin on the Launch Blog and NASA TV at 2:15 p.m. In the meantime, we will report breaking news here as events warrant.